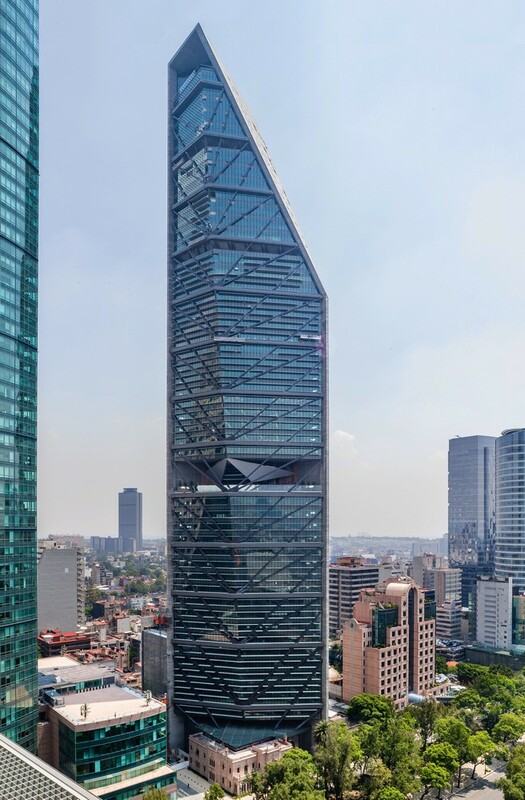 The Royal Institute of British Architects (RIBA) has announced the winners of the RIBA Awards for International Excellence and the 2018 RIBA International Emerging Architect, including BBVA Bancomer Tower by LegoRogers (Rogers Stirk Harbour + Partners and Legorreta + Legorreta). 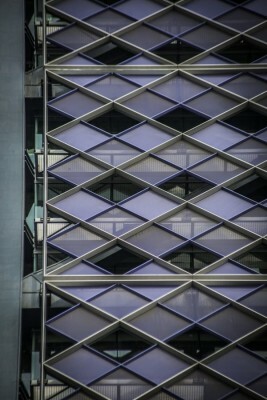 A bespoke headquarters for an international bank. The BBVA Bancomer Tower demonstrates an elegant response to a complicated site, both in terms of its urbanism and its solution to the complexities of tall buildings. 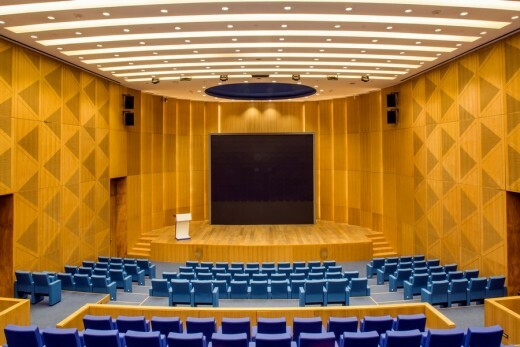 LegoRogers’ launch new BBVA Bancomer headquarters in Mexico City. 10 February – Mexico City: The President of Mexico officially opens new headquarters designed by LegoRogers for BBVA Bancomer in Mexico City. 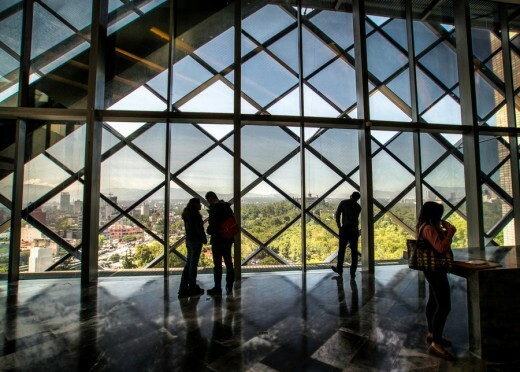 The President of Mexico, Enrique Peña Nieto, will officially opened a new urban landmark on the skyline of Mexico City – BBVA Bancomer’s new headquarters today (9th February). 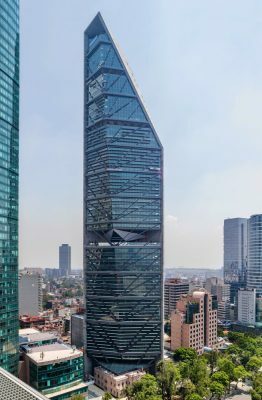 The 50-storey office tower is the first completed building by LegoRogers, a collaboration between international architectural practice Rogers Stirk Harbour + Partners and Mexican firm Legorreta + Legorreta. 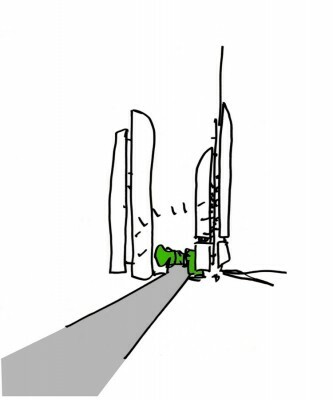 The architecture brings together both practice’s different architectural languages yet common values to create a building that is both contextual and distinctive. 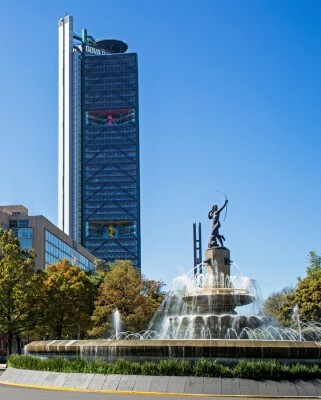 A new urban landmark on the skyline of Mexico City, the BBVA Bancomer tower marks the gateway to the Paseo de la Reforma from Chapultepec Park. 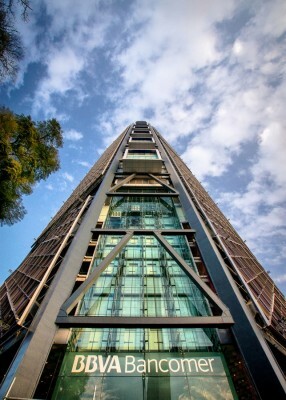 The BBVA Bancomer tower is the result of a collaboration between architectural practices Rogers Stirk Harbour + Partners and Legorreta +Legorreta. In bringing together their different architectural languages yet common values, they have created a building that is bothcontextual and distinctive. 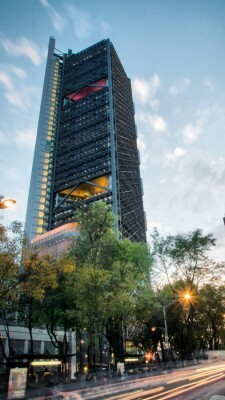 LegoRogers’ new headquarters building for BBVA Bancomer opens in Mexico City. 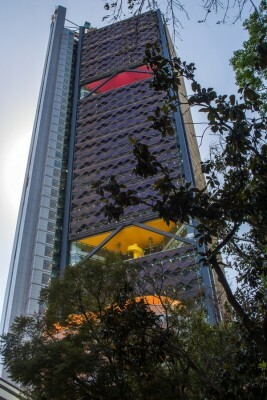 Located on the Paseo de la Reforma, the tower marks a gateway to Chapultepec Park with sky gardens overlooking the city and the park. The architecture aims to promote a sense of community and interaction between staff. 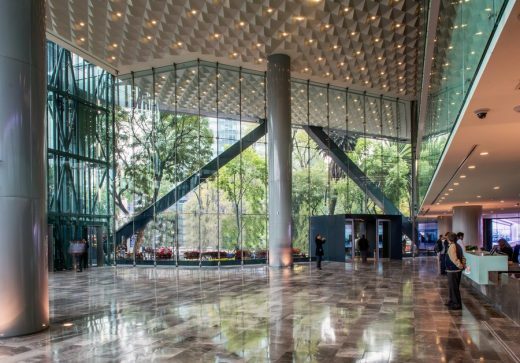 On the ground floor, the triple-height lobby sits on the corner of Paseo de la Reforma, which links the daily operations of the bank branch with executive-level commercial businesses at higher levels. In the lobby, glass elevators face the park and will transport visitors arriving by foot, as well as the employees up to the sky lobby at level 12. The sky lobby is a window to the city and the park. 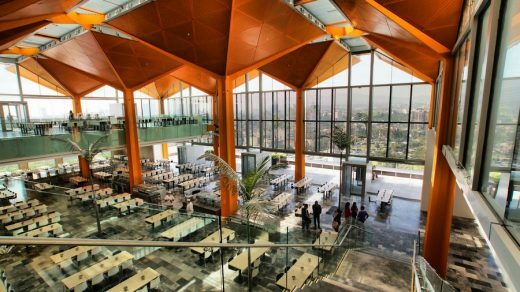 This area will be used for exhibitions and public events and connects the hall and dining room with terraces overlooking Chapultepec Park. At this level security manages visitor access to the building. The VIPs and executives access the building through a separate lobby on the ground floor, with a dedicated access area for vehicles to guarantee a high level of security and privacy. The executive elevator offers direct access to the top executive floors and discreet access to public floors of the building, including the heliport. 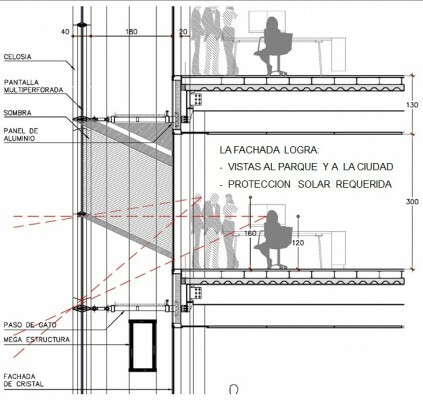 The building’s main structure is externally expressed to provide flexibility in planning internal office spaces. 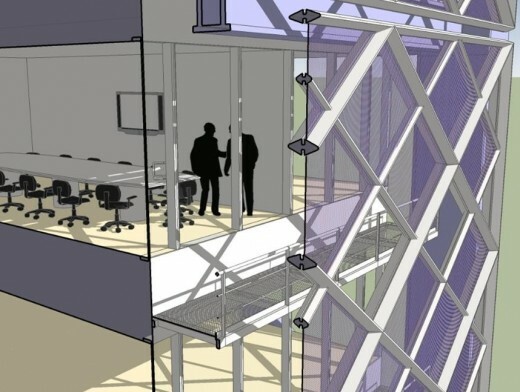 The external braced frame provides the seismic structural system to the building allowing the core to be arranged diagonally organising office space on two sides. 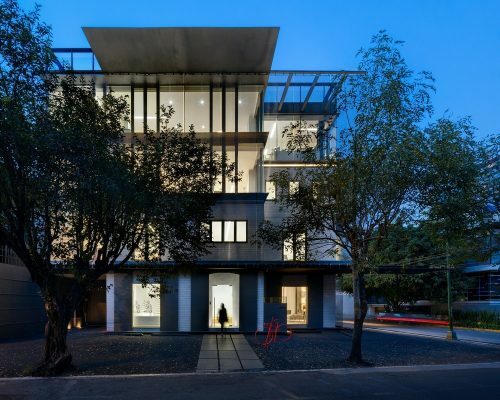 The result moves away from the traditional centre core, four sided floor layout and responds to the spectacular views towards the city and Chapultepec Park. Sky gardens every nine floors create outdoor space within the tower and provide meeting and break-out areas where people can enjoy spectacular views of the city. The façade design is inspired by the Mexican traditions and architectural heritage. 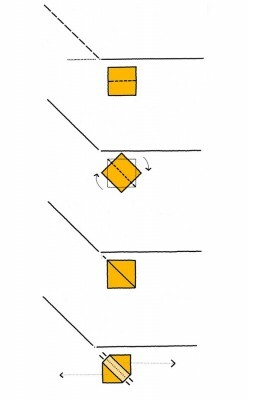 The geometry of the diagonal structure is used to create a lattice frame to protect the façade from direct light and heat from the sun. As a result, the building has been awarded a Gold LEED energy standard. 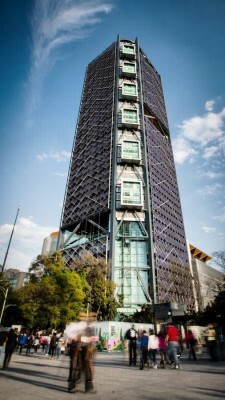 The tower provides 78,800m² of prime office space for BBVA Bancomer and can accommodate 4,500 members of staff. 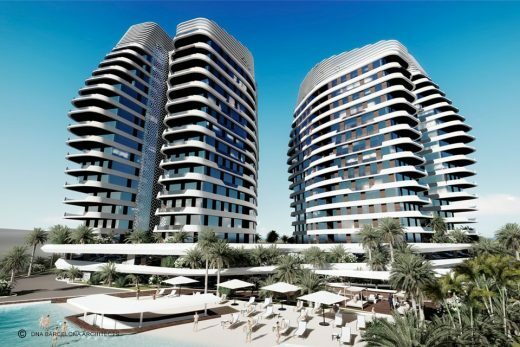 – It provides flexibility in re-planning the building for future change. 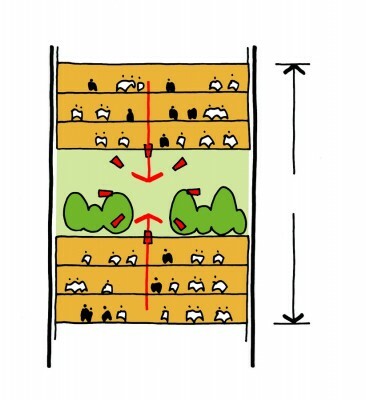 – It responds both socially and environmentally by minimizing resource consumption, waste and greenhouse gas emissions, while the use of passive solar protection systems are maximized to reduce energy consumption. 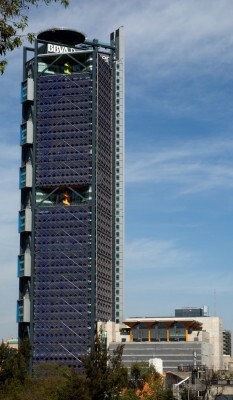 The BBVA Bancomer Tower is a distinctive landmark on Mexico City’s developing skyline. Legorreta + Legorreta Team: Ricardo Legorreta, Víctor Legorreta, Miguel Almaraz, Adriana Ciklik, Carlos Vargas, Miguel Alatriste, Víctor Figueroa, Mariana Gómez, Lourdes del Val, José Luis Barrera, Gerardo Martínez, José Luis Corona, Óscar Islas, Guillermo Mateos, Alejandro Ramírez, Francisco Espinosa, Oswaldo Anaya, Fredy López, Joel Rojas, Emmanuel Pérez, Andrés Martínez – Lanz, Gerardo González, Samuel Corona and Fernanda Argüello. Rogers Stirk Harbour + Partners Team: Richard Rogers, Graham Stirk, Ivan Harbour, Mike Davies, Lennart Grut, Andrew Morris, Richard Paul, Ian Birtles, Simon Smithson, Tracy Meller, John McElgunn, Stephen Barrett, Andrew Tyley, Stephen Light, James Leathem, Georgina Robledo, Mark Darbon, Mark Gorton, Douglas Paul, Dennis Austin, Matt Cooper, Benjamin Darras, Michael Hughes, Dirk Krolikowski, Leonardo Pelleriti, Barbara Perez, James Stopps, Simon Tonks and Alex Zimmerman. Structural Engineer: ARUP, Colinas de Buen S.A. de C.V.
Public health Installations: Garza Maldonado y Asociados S.C.
Security: LOGEN S.A. de C.V. Consultant Smoke Detection: LOGEN S.A. de C.V.
Acoustic: Saad Acústica S.A. de C.V.
Multimeda: Saad Acústica S.A. de C.V. 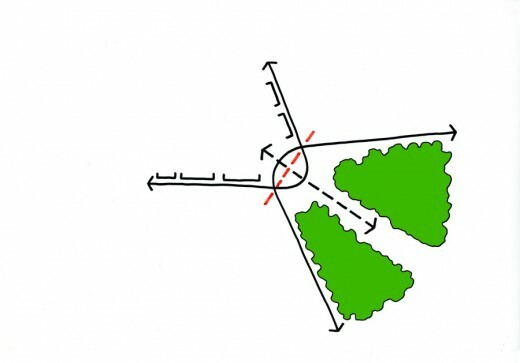 Thermal Analysis Façade Consultant: DYPRO S.A. de C.V.
Landscape Design: Espacios Verdes S.A. de C.V. The design team – formed by a partnership between Rogers Stirk Harbour + Partners, an international award winning practice, and Legorreta + Legorreta, a premier Mexican firm with extensive experience working in both Mexico and worldwide. Both Legorreta + Legorreta and Rogers Stirk Harbour + Partners are internationally known for designing and building several buildings that are considered today as architectural icons representing cities and countries. 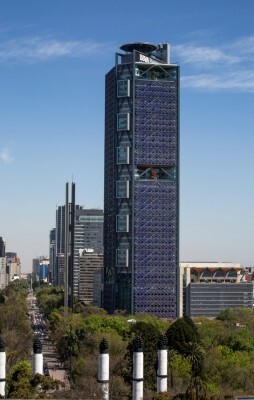 Among them are the Hotel Camino Real in Mexico D.F designed by Legorreta + Legorreta and The Leadenhall Building, an office tower in London designed by Rogers Stirk Harbour + Partners. 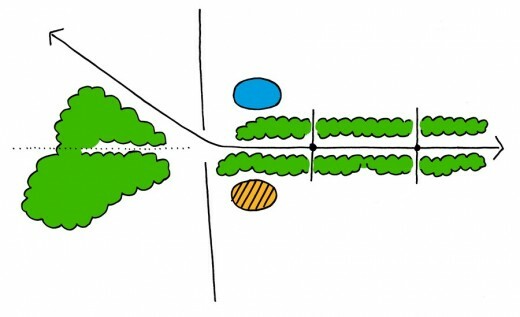 The collaboration between the two firms – with different architectural languages but common values – has generated a unique architectural style which, rather than manifesting the diverging expressions of each practice – offers a special, new design approach for this project and for the City of Mexico. 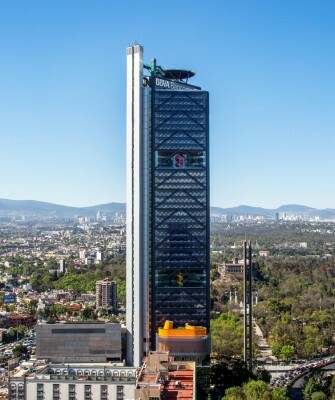 These two offices forming the partnership of LegoRogers have designed the new BBVA Bancomer’s headquarters Tower that is a new building of reference in Mexico City’s skyline. Since its founding in 1965 by Ricardo Legorreta, Noe Castro and Carlos Vargas senior as Legorreta Architects (now Legorreta + Legorreta), have managed to stay true to their original goal of creating the best architecture inspired by human values. Legorreta + Legorreta seek to create an architecture that meets the needs of society, while contributing to building better cities. Achieving functionality, efficiency and cost control, they design friendly and human environments, with atmospheres that convey peace, privacy and optimism. Legorreta + Legorreta has developed projects for various institutions around the world, including Stanford, UCLA, Chicago, ITESM, the American University in Cairo and four buildings for HBKU in Qatar, as well as the Papalote Children’s Museum, the Museum of Science and History in Fort Worth, the Ministry of Foreign Affairs and the building of the High Court in Mexico City, among many others. Currently, Victor Legorreta leads the firm as Managing Director and Design Director with the support of four partners: Miguel Almaraz and Carlos Vargas, Project Managers; Adriana Ciklik, Operations and Project Director and Miguel Alatriste directing the Administrative and Finance Department. 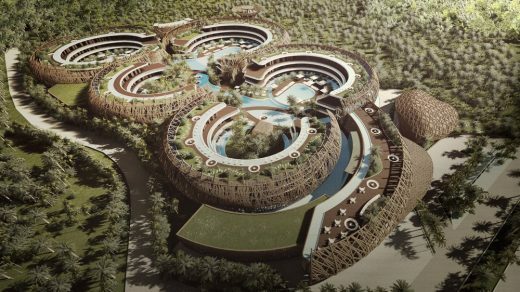 They have a long history and experience and will continue to focus their daily work in designing a human architecture highlighting Mexican roots while exploring new ways of design, using new technologies and responding to the needs of modern society. 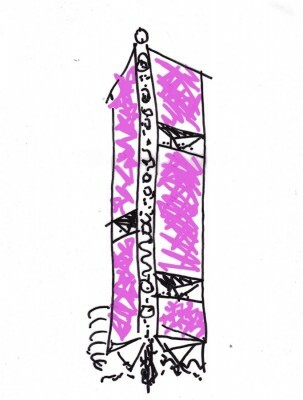 Rogers Stirk Harbour Partners (RSHP) is an award winning, international architectural practice based in London with offices in Sydney and Shanghai employing over 200 people worldwide, including 13 partners and 14 associate partners. Over the past three decades, RSHP has attracted critical acclaim with innovative projects across Europe, Asia and North America. The practice is experienced in designing a wide range of building types, including office, residential, transport, education, culture, leisure, retail, civic and healthcare. 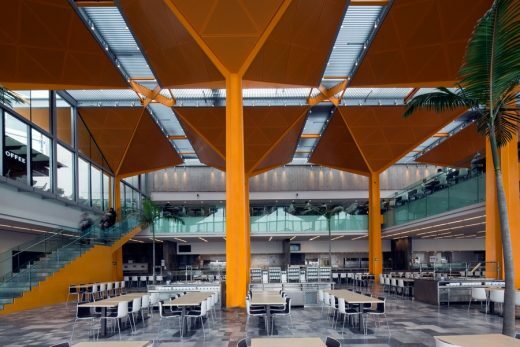 The quality of its designs has been recognised with some of architecture’s highest awards, including two RIBA Stirling Prizes for Terminal 4 at Barajas Airport in Madrid in 2006 and Maggie’s Cancer Care Centre, London in 2009. 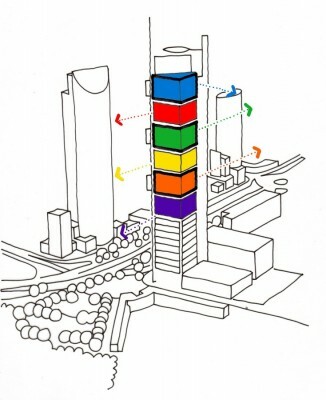 Richard Rogers is the 2007 Pritzker Architecture Prize Laureate, winner of the 2000 Praemium Imperiale Prize for Architecture and the recipient of the RIBA Gold Medal in 1985. Richard was awarded the Legion d’Honneur in 1986, knighted in 1991 and made a life peer in 1996. He was Chief Advisor on Architecture and Urbanism to the former Mayor of the City of London, Ken Livingstone and has played an advisory role to the current Mayor of London, Boris Johnson. He has acted as Chairman of the British Government’s Urban Work Force and was a member of the Mayor of Barcelona’s Urban Strategies Advisory Council. Richard Rogers Partnership became Rogers Stirk Harbour in 2007 to reflect the growing importance of the younger partners, Graham Stirk and Ivan Harbour, and their role alongside Richard Rogers in the practice’s future. 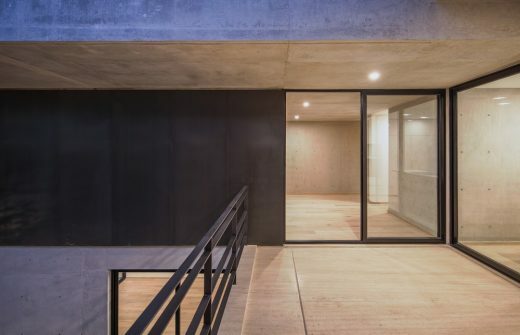 Together with other long-standing partners, Stirk and Harbour represent the inherent continuity and consistency of the philosophy which the practice applies to all of its work. The name change also demonstrates the practice’s confidence in its ability to continue to meet those challenges still to come. The building is based on the reinterpretation of traditional office space organisation, offering a variety of new flexible working environments for all users. Sky gardens every nine floors create outdoor space within the tower and provide meeting and break-out areas where people can enjoy spectacular views. Consequently, the architecture promotes a sense of community and interaction between staff. Amsterdam 75 House, Hipódromo, México D.F.